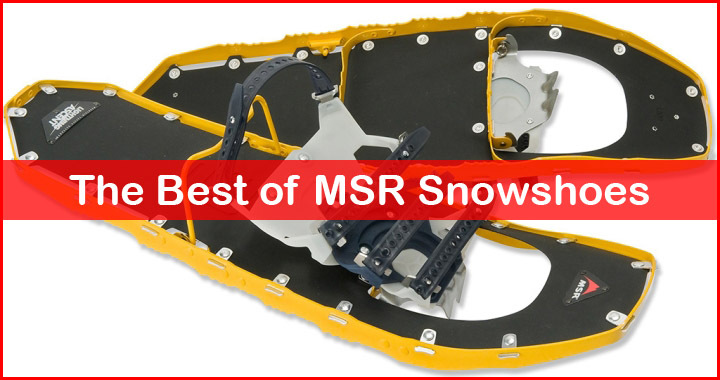 MSR Snowshoes are among the finest you can find in the market today. They’re not necessarily inexpensive but if you want the best bang for your buck, MSR is the way to go. The company has been around for decades and for all those years, they have never stopped innovating and refining their products. The Lightning Ascent and Evo Ascent are only a few of their snowshoes that receive a lot of positive feedback from winter sports enthusiasts. Their durability, unmatched performance, and ease of use are the main attraction that draws so many winter explorers to entrust their safety to them. Not to say their versatility as well. They’re all can be paired with add-on flotation tails that extend the length of the snowshoes for better flotation, should the terrain demands it. MSR Snowshoes are categorized into three classes: Ascent series, Explore series, and Trail series. The main difference between the three is the bindings and the materials for frames and decking. Ascent series have the most secure bindings of all, consisting of three straps-in features that firmly attach the snowshoes to your boots. It sure is great to have such security when you’re up to some long distance off-trail hiking where the varying snow conditions can easily loosen the straps. However, it can be intimidating too for beginners, not to say uncomfortable. This is where the Explore and Trail series come in. They offer comfortable binding systems that are easy to use for shorter recreational hiking and less demanding terrains. What’s Hot: Lightweight, remarkable traction, great flotation. What’s Not: Straps-in feature not user-friendly. There is a lot to love from MSR Lightning Ascent, especially if you’re a die-hard backcountry traveler. First of all, they have the most aggressive traction systems of all MSR Snowshoes. Heck, no snowshoes today rival the aggressiveness of MSR Lightning Ascent traction. They will not only help you ascend more swiftly but also descend more safely. Traversing or side-walking across wide slopes are not that hard anymore, thanks to the innovative 360-degree traction frames. On to the decking, you’ll be happy to know that it’s not just a lightweight nylon. The material has been infused with urethane for improved durability. The PosiLock AT bindings are not the most comfortable system you can find on modern snowshoes, but they will keep your feet secured to the contraption, regardless of what snow you’ve been through. The bindings are connected to the decking through a full-rotating pivot that promotes unrestricted motion on your feet as you walk. Such is an ideal setting for backcountry snowshoes, considering it allows the wearers to stride more naturally, hence keeping the fatigue accumulation to minimum. They do make you walk more slowly, though. But that’s exactly a part of backcountry exploration, right? You wander off slowly through the beaten off-trail paths, enjoying the solitude. The Explore series by MSR Snowshoes put bigger emphasize on user’s comfort through all different winter terrains. This is achieved by incorporating what the company dub as HyperLink bindings. On a glance, they look much simpler than the three-straps binding system on Ascent series with just only one strap going over your front feet. It reduces the pressure point on your feet, hence improving the overall comfort. To help that single-strap system secure your feet, the pads on which it’s connected are made to be larger, almost covering the entire forefoot. In terms of ease of use, well I guess it’s pretty obvious by now. It’s a whole lot faster and easier to get in and out a binding with one strap than three straps. Performance-wise, MSR Revo Explore don’t fall too far behind MSR Lightning Ascent. They still sport the aggressive perimeter crampons that go from the front to the back of the snowshoes. They work wonder at providing horizontal traction as you make long traverses across the hills. Vertical traction is not similarly superior, though, since the aluminum teeth bars under the heel are non-existent in this model. Still, they’re still very much capable of helping you cover moderate to slightly steep terrains. We’ve listed MSR Evo in our “Top 10 Snowshoes” list because of the overall value they have to offer. 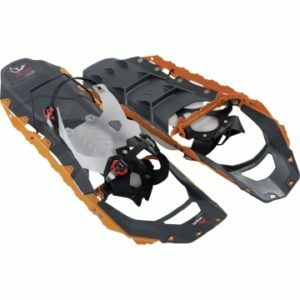 It’s hard to find snowshoes that deliver wonderful performance on trails in such a low price range. Even more than that, these affordable snowshoes can still tackle moderate rolling hills easily, thanks to the side traction rails. That’s something not all inexpensive recreational snowshoes can do. 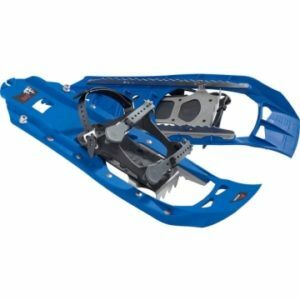 The all-plastic UniBody deck design is less sturdy than any other MSR Snowshoes. By that, I mean as long as you don’t step into a hard rock that’s hidden beneath soft snow, you’ll be fine with it. Meanwhile, the bindings feature two straps that can be adjusted easily, even when you still have your gloves on. Available in 22-inch size only, you can’t expect to explore the deep snow areas with MSR Evo. That’s just too short to provide the necessary flotation. Besides, these snowshoes are originally meant for recreational applications on groomed trails and packed snow. They’re not designed for longer hiking along the backcountry access. Still, you can enhance the flotation using the 5-inch optional add-on tails. They’ll be handy if your weight load exceeds the recommended amount, which is 180-pound or if your favorite trails happen to have more fresh powder than usual. MSR Evo Ascent is the upgraded version of the regular Evo. What separate the two snowshoes are the TriFit bindings and a Televators or heel lifts. They’re a perfect choice for those who want to expand their winter exploration to more challenging and technical terrains. The TriFit bindings are more of a hassle than the DuoFit bindings on the original MSR Evo, but they’re far more superior in terms of security. In a long backcountry trip where you’re going to be dealing with varying snow conditions, you will want your snowshoes to be secured onto your feet all the time. The heel lifts, or Televators as MSR calls them, are nice little feature that help minimize calf fatigue on steep ascent. 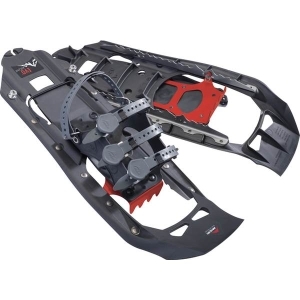 All Ascent Series snowshoes by MSR and also a whole lot other backcountry snowshoes by other manufacturers have heel lifts. What makes us prefer MSR, however, is that they can be flipped effortlessly. By the way, MSR Evo Ascent is only available in size 22-inch too. So make sure you get the add-on flotation tails to help you through the deep snow. Now, if you’re still up to enjoying the tranquility in a quiet backcountry exploration but not fond of the steep investment you have to afford on MSR Lightning Ascent, MSR Evo Ascent got you covered.